My 2016 Ford Escape caught fire on 12/24/2018. The car was sitting in an open parking space and had not been driven since the afternoon the day before. Note the engine was cold when this happened. In the early afternoon on 12/24/2018, my husband was walking out to our Ford Escape when he noticed smoke was coming from the front of the Escape. 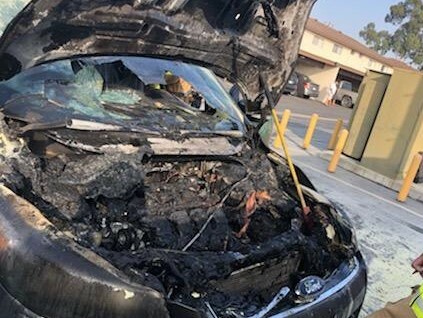 When he arrived at the car, witnesses said the Escape had started smoking on its own and they had heard noises coming from under the hood of the car. The fire department arrived on the scene and extinguished the fire. According to the fire report completed by the fire department, the cause of the fire was determined to be malfunctioning electrical. We had purchased vehicle with the extended warranty. The extended warranty covered bumper to bumper . We of course spoke to the Ken Grody Ford where we bought the car and they told us because this was a fire, it has to go through the Ford General Counsel. We file the claim with the customer service department of Ford. We were told that the General Counsel would respond within 15 days. That time frame has come and gone. We have complained many times to the customer service. However, Ford has failed to respond to us. AAA has towed the car to a secure site as the car was a health and safety issue where it was sitting. AAA has been trying to get Ford to come and inspect the car so that the actual cause of the fire can be determined. But Ford will not respond to them either. What is most alarming to me and should be alarming to everyone, is the fact the Ford does not care what caused this fire. Had the fire started fifteen minutes later, my family would have been in the car. Not only would my family had been in harms way but so would of the others cars around us. We are now without a car and yet Ford expects us to continue paying them for a piece of junk. Ford needs to rectify this problem.